RAWIllumination.net: Cosmic Trigger Reading Group, Week Six! Cosmic Trigger Reading Group, Week Six! Welcome to week 6 of the group reading of Cosmic Trigger. 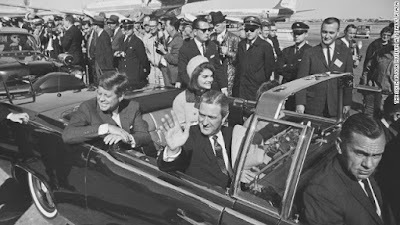 This week we are looking at a pivotal duo of chapters, The Kennedy Assassination and the Net—29 (31 old) and A visit to Millbrook—31 (33 old), in which Wilson both completes his set-up and time loops us to the conclusion of the book, in the process setting us up for the particular and peculiar slice of life and history that Cosmic Trigger chronicles. It’s worth noting the shift in culture as exemplified in music from the time of Bob’s first peyote trip in December 1962 to the conclusion of CT narrative in December 1976. In late 1962 the biggest band in America was Frankie Valli and the Four Seasons, and Bob Dylan had recorded and not yet released Blowin’ in the Wind, which failed to chart anywhere in the world. By the time we reach the conclusion of Cosmic Trigger, 14 years later, we’ve had The Beatles, The Stones, The Doors, Frank Zappa and the Mothers of Invention, The Velvet Underground, David Bowie, and Donna Summer. Vast active cultural changes indeed. The chronology of this week’s reading is pretty simple; we are introduced to Kerry Thornley and Lee Harvey Oswald, Jano Watts introduces Bob to the notion of The Net, John F. Kennedy is assassinated, Bob and his family move back to the city, and The Writer interviews Timothy Leary. Thematically Bob continues to build on the themes he has already introduced, as well as introducing a few new ones, including one huge theme that will lurk in the background for the entire book—the notion that the “national psyche veered dizzily toward Chapel Perilous.” (30-31) Remember that according to Bob everyone who enters Chapel Perilous comes out agnostic or stone paranoid—then compare the USA of May 16, 2016 to the USA of November 21, 1963. Today, agnosticism runs rampant—sexual agnosticism, gender agnosticism, racial agnosticism—at the same time that paranoia runs deep with an increasingly vocal portion of the population trumpeting their own steadily increasing fears and paranoias in these same realms. A couple of my favorite bits include the rant on page 31 regarding “opinions” and proofs, and the entirety of the chapter on Leary, which is constructed with such density that it would take an entire book just to unpack it. Hint—Cosmic Trigger is that book! That’s it for this week—I’ll post the themes in comments, please post your own insights, hints, and suggestions there as well. Next week we will be reading The Queen of Space, The 23 Enigma, and The heresy hunt begins, pages 39-49 (41-51 old). 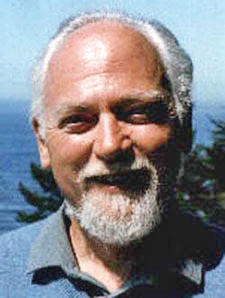 Wilson, Robert Anton. "The Scientific Contributions of Dr. Timothy Leary, 1957-74." Fragment (pp.44-132) of an unpublished typescript, complete in itself. The first work of its kind. Some of the material was incorporated in J328 and in the author's _The Cosmic Trigger_ (B33). Wilson, Robert Anton. "Strongly Differing View on Tim." _San Francisco Phoenix_ (Oct.24): 1, 5, 7. A thorough documentation of Leary's scientific work, and his persecution for his ideas. I have sometimes suspected that the plot to drive us all mad began with the killing of Oswald. “That strange prescience”: In early 1968 Ginzburg published an article gloating over a has-been politician named Richard Nixon. A bit of cautious evasion that is no longer needed: Dr. Richard Alpert was the homosexual who was reprogrammed. I finally decided to purchase Adam Gorightly's "The Prankster and The Conspiracy" which fleshes out many of the details behind this story thread of CT. Having been in the Marine Corps it is entertaining to think of the ways I have been brainwashed in boot camp. Certainly nothing like Kerry Thornly's situation, but the basic formula/techniques are used on all recruits. I suspect that for current times 911 is comparable to the Kennedy assassination as in we will never know the whole "Truth" if there is such a thing. RAW's interview with Leary at Millbrook is so different from the other stories coming out at that time. Others seem sensational in discussing the environment and behaiviors, RAW's focus is on understanding Leary's scientific work. It's easy to see why they bonded during the interview. This is work that could still be ground breaking if implemented now over 50 years later. This section helps establish Leary as a scientist first as opposed to many other ways he has been described. Maybe out of the 24 different ones, this was the Timothy Leary that RAW deserved that day. Thanks for including the link to the Realist. I reread Eliot's Waste Land last week, and I suspect that poem influenced Bob's ideas about Chapel Perilous. Bob mentions Frazer on page 32 of the New Falcon edition, and Eliot cited Frazer as a major source for the Waste Land. Alas, I don't think agnosticism runs rampant. We have some agnosticism, but we still have a ton of certainty in our society. I have thought about traveling back in time to participate in the Millbrook Obesity Project. Brian Shields told me he would have liked to participate. Apparently the prison experiment didn't cut the recidivism rate. I've seen different numbers on that. Synchronistically, yesterday's daily email from the New Yorker had pieces on William Burroughs and Jack Kerouac, two of those involved in Leary's research around the time of Bob's piece (although Jack didn't dig it). Did Lee Harvey Oswald kill Aldous Huxley? I must admit I don't like the title "life coach", but Dr. Tim did seem to predict it fifty years ago. Leary's distaste for speculating beyond the data declined over the years. Near the end of Tim's life, Bob said to him, "Timothy, I've met George Carlin, but you're still the funniest man I've ever met. I've met Buckminster Fuller, but you're still the smartest man I've ever met." Tim said, "Robert, you're an excellent judge of character." Death is brought into our Beloved Romance in a pretty big way with the advent of the "Kennedy Assassination and the Net" chapter. one of the most famous and controversial deaths in history. Death will appear a major character in Cosmic Trigger; it shares that in common with Gravity's Rainbow. In the following chapter, "A visit to Millbrook" [ "A" resembles an abbreviation pun on Leary's favorite sacrament - based on correspondence I've read. I connect it with electricity or Fire. Millbrook recalls Water again: M = mem = Water. ]RAW mentions that Leary is studying "The Tibetan Book of the Dead" and in the same sentence says he's otherwise into Scientific Clinical Psychology. This seems a perfect combination, to me, when you consider that much of his research involved the death of the psyche. So your high and the psyche is temporarily dead, now what? Enter the Tibetan Book of the Dead with other esoteric metaprogramming scripts to follow. All experiments aligning to scientific method. I really like the way RAW juxtaposes what's happening with his explorations and historical events significant to him. Perhaps it shows very broad awareness or awareness of connectivity, the Mystics perception? - either partially inspired or affirmed by Jano telling him about the Net. Or maybe he's simply presenting the reader with a broader picture of the events in that time-frame? RAW embraces Discordianism and becomes a close friend with Thornley then Thornley gets caught up in conspiracy theories making the Kennedy assassination, along with the connection to his family doctor, quite personal to RAW. p. 30 the description of Watts' marriage to Jano also matches RAW's marriage to Arlen. Qabala might suggest how or why, but that's another story. p. 31 - The paragraph on opinions and proofs reminds me of the farce that is the American election process. RAW's early visit to Leary at Millbrook clearly places him on the leading edge of the 60s cultural wave - as he says, others repeated the journey then ends with the line (p32): "...seekers-after-Wonder) up the Hudson to the Millbrook Ashram" that suggests a chapter in "The Book of Lies", to me. Typo above - The end of this sentence should be corrected to read: "...Thornley gets caught up in conspiracy theories, and along with the connection to his family doctor, makes the Kennedy assassination quite personal to RAW." "In the case of the JFK assassination, trust has long been a part of the problem. When it comes to the assassination of President John F. Kennedy don’t trust any one source. Don’t trust this book. Don’t trust even the government’s basic documentation and pronouncements. Today the evidence of duplicity and fraud is too apparent to ignore." In deed; trust no one is what we’ve learned from the fallout from JFK’s murder. Michael—thanks for the reference to An Annotated Bibliography of Timothy Leary; that is a tempting volume. Arthur—that “cautious evasion” cut two ways apparently, protecting Richard Alpert from “the [oppresive] attitude of the East Coast” (http://www.throughyourbody.com/ram-dass-talking-about-being-gay-being-soul-friends-and-just-being/) as well as concealing the lack of long-term effectiveness of the re-programming. Dustin—I almost included a reference to 9/11 in this week’s post. Your reference to boot camp brainwashing reminds me of Kubrick’s Full Metal Jacket. Eric—thanks for the reference to The Waste Land; the one is always worth a re-read. My point re agnosticism and paranoia was that in the 40 years since Cosmic Trigger was written society at large has moved so far from binary that the people who are still clinging to that mode, which was “normal” in 1976, look more and more paranoid today. Witness the brouhaha over North Carolina’s new “bathroom laws”. I like your Oswald /Huxley joke. Oz—as always you give me much food for thought and more connections than I can keep up with! Giordanista—I try to trust everyone to “be” themselves. It always amazes me when people “believe” something just because someone said it. Thanks for the encouragement, Chas. p.33 These seem like two key sentences: "I always go through a process in which the space game comes to an end, the time game comes to an end, and then the Timothy Leary game comes to an end. This is the peak, and at this point a new neurological imprint can be made, because all the imprints are suspended for a while then." In his book, "High Priest" he talks about this process in terms of death and rebirth. I would call this death of the ego, and I refer to the peak of reimprinting as the choice-point space. p. 34 " The synergetic theory of 'dosage, set, and setting' may be Dr. Leary's outstanding contribution to the science of pyscho-pharmacology" I fully agree, but would extend it to say it's an outstanding contribution to the science of transformation in general as the wisdom of set, setting and dosage appears to benefit any meditation or spiritual practice, in my opinion. I realized after speculating in the previous comment about RAW comparing his personal life events with world events that magically, it could look like a juxtaposition of the microcosm with the macrocosm. I'm also continue to be fascinated by the comparison of this week's two chapters. In the "Kennedy Assassination and the Net" we confront a famous, controversial, and quite literal, death. A death that RAW compares to the myth of the sacrifice of the Divine King. The next chapter, " A visit to Millbrook" brings up a controversial and famous METAPHORICAL aspect of death in connection with Timothy Leary(death of the ego); this 'death' isn't explicitly called that though alluded to through the "Tibetan Book of Dead" getting mentioned and described as a technique, twice. I would also suggest that RAW subtly alludes to Leary getting sacrificed like the Divine King, this time metaphorically also. Leary's character got systematically assassinated starting from when he got fired from Harvard going downhill from there with all his legal problems including getting sentenced to 30 years in prison for ideas he was telling to young people according to the court transcript (published in "Changing My Mind Among Others"); living as an expatriate fugitive; getting illegally kidnapped by U.S. Feds then having nearly the entire counter-culture turn on him a few years later when rumors circulated that he became a Federal informer ratting out his friends to get out of jail. He had, but only in a minor largely non-damaging way according to Joanna Leary's account. RAW was one of the few to agnostically and non-judgementally stand by him. I don't consider it a random coincidence that the paragraph about opinions and proofs almost immediately precedes the one about Leary. The Net.....I was born on November 22, 1974. Eleven years after that infamous day of Kennedy and Huxley' s death. Exactly one year later to the day Bob Shea wrote a letter to Greg Hill speculating that synchronicity or The Net connects Kerry Thornly to the assassination. This reminds me of Isreal Regardie's description of Indra' s Net in the intro to Prometheus Rising. The harder one looks for connections the more they find. It seems to me that one test of whether one has adopted an agnostic attitude is a willingness to listen to the ideas of Timothy Leary, as opposed to believing the "opinion of his enemies" that is largely reflected in the popular attitude towards him. I love this sentence so much: "Everybody nowadays thinks they must have an 'opinion' on everything, whether they know anything about it or not." Compare with the Buddha's complaint that people have "a wilderness of views." Cosmic Trigger online reading group, Week Eight! 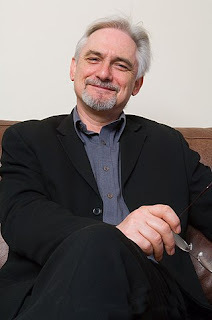 Eric Wagner and RAW on Pound and Illuminatus!